This study included 17 patients with CNH and the other lesions of the ear that incoming differential diagnoses of CNH, including basal cell carcinoma (19 patients), squamous cell carcinoma (17 patients), verruca vulgaris (9 patients), neurofibroma (3 patients), fibroepithelial polyp (8 patients), seborrheic ceratose (17 patients), and cystic lesions (41 patients), a total of 131 patients that were diagnosed between 2011 and 2012 in the Clinic of Pathology of Çankırı State Hospital. Data were retrospectively reviewed, and age at the time of diagnosis, patient demographics, clinical presentation and prediagnosis of the patients, laboratory results and extent of surgery performed were noted. Statistical analysis was performed by the SPSS 15 Statistical Package for Word. Numerical variables were shown as mean ± SD and the number of cases and percentages were used for nominal data. A p value less than 0.05 was considered as significant. With 17 patients 12.97% of the 131 patients were CNH. The mean age of the patients was 47.41 and the age range of the CNH patients was 32-79 years, with a mean age of 54.9 years (SD ± 13.23 years). Except a woman with the age of 55 years, all other CNH patients were man [Table 1]. The mean diameter of the lesions was 4.57 mm for CNH patients. The lesions were located at the right air mostly (85.71%) and all of them were located at the helix of ear [Figure 1]. The laboratory results of the CNH patients showed that most of them (88.2%, 15 patients) have high cholesterol and lipid levels. By the way six of them (35.2%) also had cardiac problems. 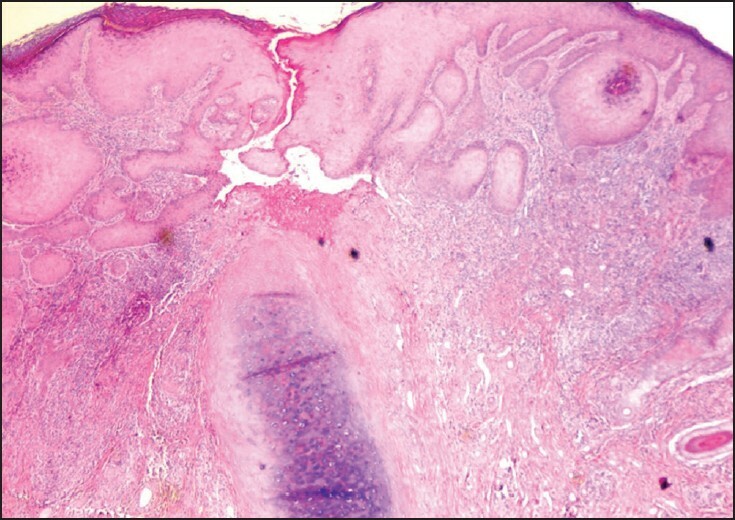 On histological examination epidermal acanthosis associated with a horny, partly parakeratotic, plug, ulceration, and crust was the most common finding [Figure 2]. Within the superficial dermis there is fibrin, sclerosis, perichondrial fibrosis, and a varying degree of cartilage degeneration. All of the patients revealed several areas of vessel thickening and hyalinization [Figure 3]. This is the first report that research the patients' cardiovascular problems, which can lead perichondrial arteriolar changes as the possible cause of underlying cartilage necrosis resulting in CNH. Uptil et al. maintained the perichondrial vasculitis theory which was initially hypothesized by Halter. 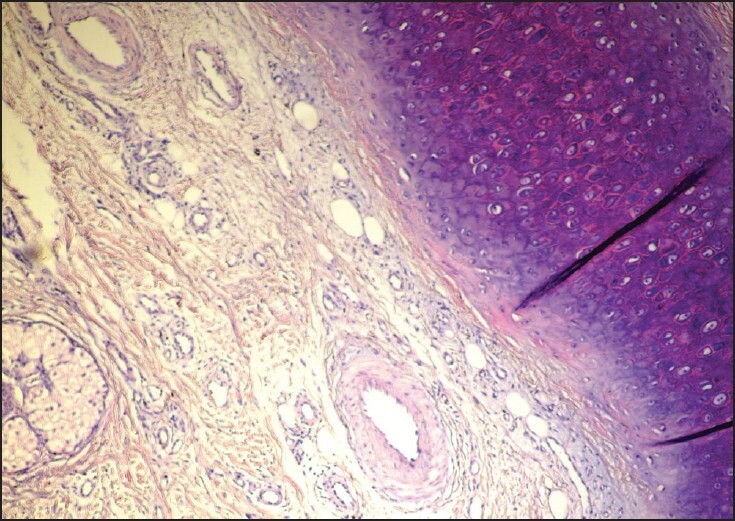 They claimed that arteriolar narrowing in perichondrium region of the pinna most remote from arterial blood supply and this has lead to ischemic changes and death of the metabolically active underlying cartilage with necrosis and extrusion leading to a cycle of severe local inflammation secondary to a foreign body reaction. We agree with this theory and decided to confirm it by searching a systemic vascular pathology for clearing this situation in the CNH patients. Really, the results of patients' health investigation support our vascular theory. 15 of 17 patients had cardiovascular problems such as hyperlipidemia, hypertension, and cardiac failure. Because of the rarity of the condition, statistical studies on incidence and prevalence of CNH have not been performed yet. Data in the literature on gender distribution reveal with few exceptions repeatedly a marked male dominance;  similarly, we determined just one female patient. During the time bilateral occurrence or multiple lesions of CNH was reported just for a few patients. ,, In our study, right ear and the superior pole of the helix are preferentially affected by CNH similar with published literature. Several theories have been suggested including trauma from cold, actinic damage, or prolonged and excessive pressure. The results of our study let us to thought that the main problem is the defect of arterial blood supply of the pinna. The laboratory results and histopathological findings of the patients support this, but we cannot explain why the target is right ear. It may be possible that right is preferred side to lie on in bad. And also we cannot explain the male predominance. However, there is a fact that cardiovascular problems and vascular diseases are most frequently seen among men. Perhaps other predispositional factors affect the both sexes equally. In the study we also tried to determine the frequency of the lesion among all other ear lesions and detected that 12.97% of the lesions were CNH, while cyctis lesions take the first place. 1. Bard JW. Chondrodermatitis nodularis chronica helicis. Dermatologica 1981;163:376-84. 2. Munnoch DA, Herbert KJ, Morris AM. Chondrodermatitis nodularis chronica helicis et antihelicis. Br J Plast Surg 1996;49:473-6. 3. Winkler M. Kno¨tchenfo¨rmige Erkrankung am Helix. Chondrodermatitis nodularis chronica helicis. Arch Dermatol Syph 1915;121:278-85. 4. Foerster OH. A painful nodular growth of the ear. J Cutan Dis 1918;36:154-6. 5. Foerster OH. Painful nodular growth of the ear. Arch Dermol Syph 1925;11:149-65. 6. Shuman R, Helwig EB. Chondrodermatitis helicis: Chondrodermatitis nodularis chronica helicis. Am J Clin Pathol 1954;24:126-44. 7. Cox NH. Posterior auricular chondrodermatitis nodularis. Clin Exp Dermatol 2002;27:324-7. 8. Feldman AL, Manstein CH, Manstein ME. Chondrodermatitis nodularis auricularis: A new name for an old disease. Plast Reconstr Surg 2009;123:25e-6. 9. Hurwitz RM. 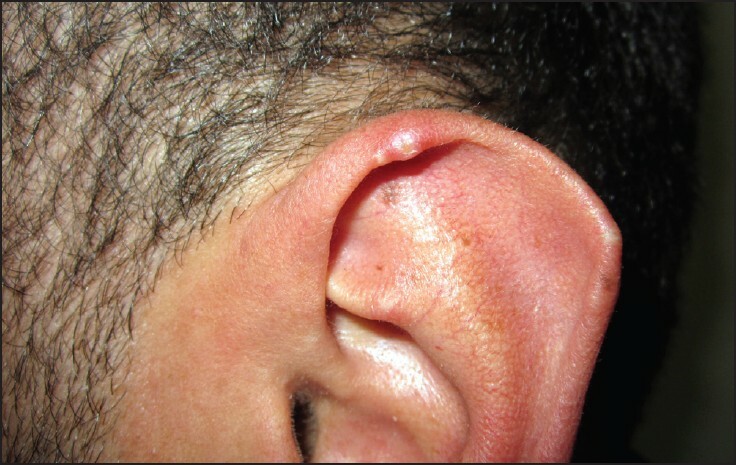 Painful papule of the ear: A follicular disorder. J Dermatol Surg Oncol 1987;13:270-4. 10. Rickli H, Hardmeier T. Chondrodermatitis nodularis chronica helicis Winkler. Pathologe 1988;9:25-9. 11. Rogers NE, Farris PK, Wang AR. Juvenile chrondrodermatitis nodularis helicis: A case report and literature review. Pediatr Dermatol 2003;20:488-90. 12. 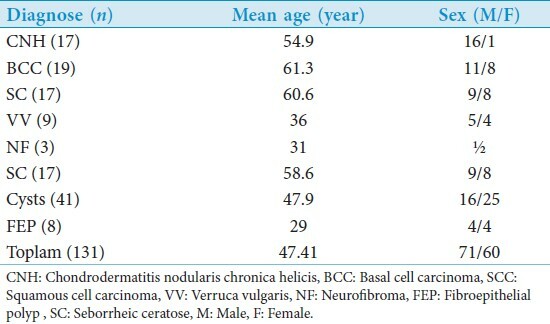 Grigoryants V, Qureshi H, Patterson JW, Lin KY. Pediatric chondrodermatitis nodularis helicis. J Craniofac Surg 2007;18:228-31. 13. Calnan J, Rossatti B. Chondrodermatitis nodularis chronica helicis or glomus tumor of the helix? A report on twentyone cases. Br J Plast Surg 1959;12:55-68. 14. Timoney N, Davison PM. Management of chondrodermatitis helicis by protective padding. A series of 12 cases and a review of literature. Br J Plast Surg 2002;55:387-9. 15. Bard JW. Chondrodermatitis nodularis chronica helicis. Dermatologica 1981;163:376-84. 17. Wagner G, Liefeith J, Sachse MM. Clinical appearance, differential diagnoses and therapeutical options of chondrodermatitis nodularis chronica helicis Winkler. J Dtsch Dermatol Ges 2011;9:287-91. 18. Lawrence CM. The treatment of chondrodermatitis nodularis with cartilage removal alone. Arch Dermatol 1991;127:530-5. 19. Kromann N, Høyer H, Reymann F. Chondrodermatitis nodularis chronica helicis treated with curettage and electrocauterization: Follow-up of a 15-year material. Acta Derm Venereol 1983;63:85-7. 20. Moncrieff M, Sassoon EM. Effective treatment of chondrodermatitis nodularis chronica helicis using a conservative approach. Br J Dermatol 2004;150:892-4. 21. Uptil T, Patel NN, Jerjes W, Singh NU, Sandison A, Michaels L. Advances in the understanding of chondrodermatitis nodularis chronica helices: The perichondrial vasculitis theory. Clin Otolaryngol 2009;34:147-50. 22. Halter K. Zur pathogenese der chondrodermatitis nodularis chronic helices. Dermat Ztshur 1936;73:270-84. 23. Hesse G, Schmoeckel C, Wichmann-Hesse A. Argonlasertherapie der Chondrodermatitis nodularis chronica helicis. Hautarzt 1994;45:222-4.